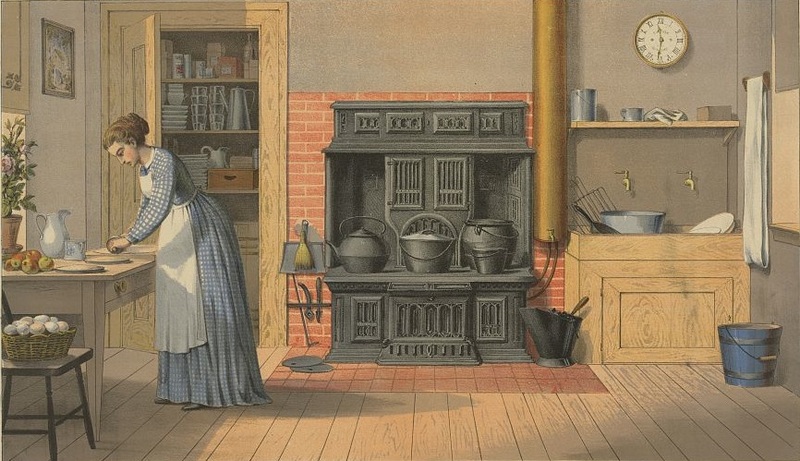 “The Kitchen,” 1874, from Prang’s Aids for Object Teaching–Trades and Occupations, a collection of twelve chromolithographic plates issued by L. Prang & Company, Boston. Courtesy of Library of Congress. The prolific and flamboyant journalist George Augustus Sala, one of several young British writers who found fame as acolytes of Charles Dickens, rose to become a regular contributor to Dickens’s weekly magazine, Household Words, and, eventually, one of The Daily Telegraph’s most well-known correspondents. Sala was actually a small boy when he first met the great author—his mother was an actress in Dickens’s 1836 play The Village Coquettes—but it was William Makepeace Thackeray who publicly praised one of Sala’s early articles and truly launched his career. His many books included travelogues, memoirs, five novels, and several collections of stories and journalism—but his spendthrift habits and public drunkenness often led to trouble, and he died virtually penniless only weeks after being forced to sell the immensely valuable library he had amassed from his travels. Sala visited the United States twice, first during the Civil War in 1863 and again in 1879. His initial visit was chronicled in the two-volume work, My Diary in America in the Midst of War, and the second trip, a lecture tour, inspired the better-known America Revisited. In addition, his admiration for American humor resulted in a three-book series of anthologies, Yankee Drolleries (1866–1870), which introduced British readers to such authors as Artemus Ward, Oliver Wendell Holmes, and James Russell Lowell—as well as two up-and-coming writers named Bret Harte and Mark Twain. After his first trip to the States, Sala complained of “the melancholy and consistent monotony of American Towns.” Even the “the glittering splendour of New York” was pockmarked by the occasional neighborhood resembling “a slovenly, untidy, ill-kept Augean stable.” But he found much improvement sixteen years later. “The truth is, that in New York there is room enough for Everybody,” he wrote in America Revisited, “whereas in London, huge as it is, there is not sufficient room for Anybody.” He also noted that by the late 1870s transatlantic visitors often ran into friends from home, as Manhattan had become a popular travel destination for the European upper class. Sala especially had a lot to say about American food. His comments range from despair and scorn to grudging, if infrequent, admiration. “It is always hard to leave New York,” he remarked, noting that the food and accommodations there were “what Europeans usually consider to be refinement and comfort.” But “once out of New York, you must expect nothing better than pork and beans and Indian pudding, or hog and hominy if you go South; the whole washed down by rough cider or molasses and water.” In a chapter describing a train trip to Baltimore, he inserted the brief digression presented below, mocking what was (according to Sala) the uniquely American passion for pie. Notes: Bohwani is Sala’s spelling for Bhowani (Bhavani), the violent incarnation of the Hindu goddess Parvati. Dan Godfrey (1831–1903) was a famous band leader and the first of three generations of famous Dan Godfreys in England, all of them musicians and conductors. For this week’s selection, we depart from the usual format and reproduce the text of Sala’s digression, “The Tyranny of Pie,” below. You may also download it as a PDF or view it in Google Docs. Almost everything that I behold in this wonderful country bears traces of improvement and reform—everything except Pie. The national manners have become softened—the men folk chew less, expectorate less, curse less; the newspapers are not half so scurrilous as our own*; the Art idea is becoming rapidly developed; culture is made more and more manifest; even “intensity” in æsthetics is beginning to be heard of and Agnosticism and other “isms” too numerous to mention find exponents in “Society,” and the one absorbing and sickening topic of conversation is no longer the Almighty Dollar—but to the tyranny of Pie there is no surcease. It is a Fetish. It is Bohwani. It is the Mexican carnage god Huitchlipotchli, continually demanding fresh victims. It is Moloch. Men may come and men may go; the Grant “Boom” may be succeeded by the Garfield “Boom;” but Pie goes on for ever. The tramp and the scallawag, in pants of looped and windowed raggedness, hunger for Pie, and impetuously demand nickel cents wherewith to purchase it; and the President of the United States, amid the chastened splendour of the White House, can enjoy no more festive fare. The day before we left New York one of the ripest scholars, the most influential journalists (on the Democratic side) the brightest wits and most genial companions in the States lunched with us. He would drink naught but Château Yquem; but he partook twice, and in amazing profusion of Pumpkin Pie. They gave me Pie at the Brevoort, and I am now fresh from the consumption of Pie at the Mount Vernon, Baltimore. Two more aristocratic hotels are not to be found on this continent. I battled strongly against this dyspepsia-dealing pastry at first; but a mulatto waiter held me with his glittering eye, and I yielded as though I had been a two-years child. The worst of this dreadful pie—be it of apple, of pumpkin, of mulberry, or of cranberry—is that it is so very nice. It is made delusively flat and thin, so that you can cut it into conveniently-sized triangular wedges, which slip down easily. Pardon this digression; but Pie really forms as important a factor in American civilisation as the pot-au-feu does in France. There is no dish at home by which we nationally stand or fall. The “roast beef of Old England” sounds very well to the strains of Mr. Dan Godfrey’s band at a dinner at the Freemason’s Tavern; but sirloin of beef is fourteen pence a pound, and there are hundreds of thousands of labouring English people who never taste roast beef from year’s end to year’s end—save when they happen to get into gaol or into the workhouse at Christmastide. * The modern American press seems to me to offend only against good taste in their omnivorous appetite of interviewing celebrated or notorious individuals (and the interviewing nuisance has become common enough in England), and in their fondness for filling their columns with brief personalities sometimes very quaint, but usually almost childishly frivolous and quite harmless. Originally published in America Revisited: From the Bay of New York to the Gulf of Mexico (1882). This sounds familiar, though although now it is the more solvent members of society who flaunt their 'pants of looped and windowed raggedness' The more things change, the more they stay the same.